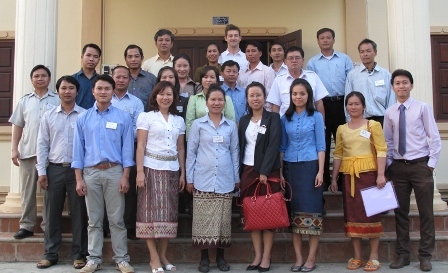 On the 10th of October 2013 at the meeting room of Louangprabang Provincial Agriculture and Forestry Office (PAFO), the ILO Regional Office and EDC jointly organised an Introduction Workshop on the ILO Community-Based Enterprise Development (C-BED) methodology and training tools. The objectives of the workshop are to provide an opportunity for organisations to learn more about the ILO Community-Based Enterprise Development (C-BED) program and to test the methodology through selected activities of the Aspiring Entrepreneurs training package. More than 20 representatives from Government agencies, mass organisations, INGOs and village producer groups attended the event. C-BED is a low cost, easy to implement training program using hands-on, activity based lessons which maximise the use of diagrams and discussion so that participants of different backgrounds can learn together. Conducted without the need for external trainers or resources, C-BED training is led by a facilitator selected from within the community who guides participants step-by-step through the learning activities.